All units of study in the Visual Arts are created, executed, and assessed based on the city, state, and national standards. Students in both core and emphasis classes are graded on units\projects as well as the average of all daily grades which consist of completion of objective and classroom interaction. Below is information about 2013-14 projects in Emphasis classes. 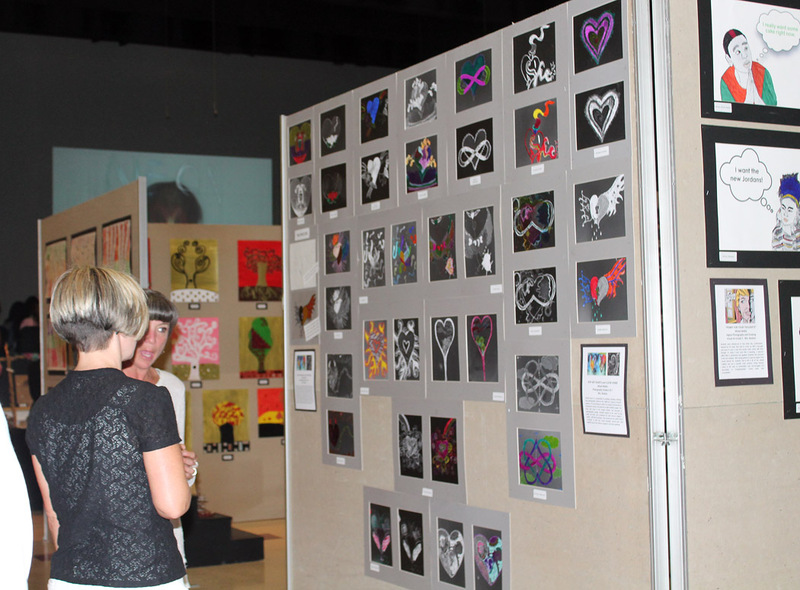 The work is displayed toward the end of each year at, AS FAR AS THE EYE CAN SEE, the annual exhibition of the Visual Arts. We had our Opening Reception on Friday, May 15. The students' work was "off the hook" - so creative and sophisticated. It was a huge success! Unit 1: Photo Composites: Through the Trees: Students learned the basic editing techniques of Adobe Photoshop as well as how to layer together - or composite - 2 images together. Unit 2: Installation Sculpture: The Lobby Needed a Face Lift: Although this is a photography class, students participated in a group project with 2 other classes. They created a border for the ceiling drop down area in the front lobby. The design features icons or symbols of all of the subjects taught at our school...ART-A-DEMICS! 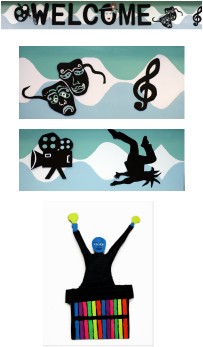 Unit 3: Ornaments: Blue Man Dudes: Students at BRAMS helped the Shubert Theatre celebrate 100 years by creating these ornaments based on the performance by Blue Man Group. Theatre staff gave the artwork as gifts to its patrons. 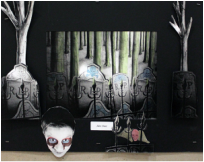 Unit 4: Mixed-Media Sculpture: This combination of photography, painting and sculpture was inspired by Installation artist, Christian Boltanski. Students learned about his work which touches on not just the Holocaust, but all human tragedy and suffering. Emphasis placed the use of light and backlight film paper as well as on posing with monotone expressions and adding purposeful blur to the pictures for a mysterious ghostly effect. Each student created his\her own box and a total of ten boxes were stacked together in two rows to simulate a chimney\smoke stack effect like some of the work of Boltanski. 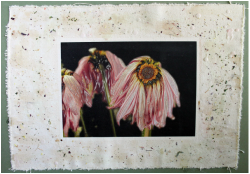 Unit 5: Mixed-Media: Flowers & Wax Students combined photography, printing on alternate surfaces, and encaustic (wax) in this project. They learned how to use special effect filters in photoshop to "match" the wax effect. They printed on transfer paper and ironed the images onto canvas. Wax was painted, dripped, and splattered on. Unit 6: PowerPoint Portfolio Presentation: At the end of each year, students create a PowerPoint presentation of all of their work which includes images of each art piece as well as the title\media\purpose of each project. Students are allowed to explore creatively with background design, font choices, and animations while still being encouraged to "keep it clean" and visually appropriate for a professional portfolio. Unit 4: Mixed-Media: "La Vida at BRAMS": This combination of photography, painting and sculpture was inspired by Installation artist, Christian Boltanski. Students learned about his work which touches on not just the Holocaust, but all human tragedy and suffering. Emphasis placed the use of light and backlight film paper as well as on posing with monotone expressions and adding purposeful blur to the pictures for a mysterious ghostly effect. Each student created his\her own box and a total of ten boxes were stacked together in two rows to simulate a chimney\smoke stack effect like some of the work of Boltanski. Unit 5: Abstract Organic Forms: Students combined photography, printing on alternate surfaces, and encaustic (wax) in this project. They learned how to use special effect filters in photoshop to "match" the wax effect. They printed on transfer paper and ironed the images onto canvas. Wax was painted, dripped, and splattered on. Unit 6: Cliche-Verre Meets Pop Art: Students combined photography, printing on alternate surfaces, and encaustic (wax) in this project. They learned how to use special effect filters in photoshop to "match" the wax effect. They printed on transfer paper and ironed the images onto canvas. Wax was painted, dripped, and splattered on. Unit 7: PowerPoint Portfolio Presentation: At the end of each year, students create a PowerPoint presentation of all of their work which includes images of each art piece as well as the title\media\purpose of each project. Students are allowed to explore creatively with background design, font choices, and animations while still being encouraged to "keep it clean" and visually appropriate for a professional portfolio. As part of the grade 6 photography curriculum and data collection, students have to demonstrate comprehension of Camera Mechanics, Film Development, Darkroom Processes, and The Artistic Elements of Photography. They have one pre\post test per marking period. Unit 1: Camera Parts and How They Work: Students learned to identify all of the parts of the camera and what they do through handouts, diagrams, posters, games, and hands-on practice. 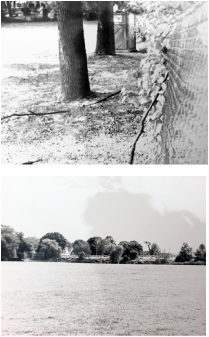 Unit 2: Film Development and Darkroom Processes: Students learned how to develop film and make a test strip and enlargement in the darkroom. Units 1-2 Project: My First Pictures: Students took pictures of random things and each other outside just to get used to working the camera and so they'd have film and images to develop and work with. Unit 3: The Artistic Elements of Photography: Students were introduced to the elements that make a good photograph - light, shape, form, line, texture, focus, angle, composition - by way of handouts, show of examples, games, videos, etc. .
Unit 4: Lighting and Portraiture: Following up Unit 3 with a hands-on project, students had fun playing dress up but had to create portraits of each other paying close attention to light direction and close-up composition. Unit 5: Flowers & Bugs: Continuing to now create artistic photographs instead of snap shots, students were introduced to photographer, Imogen Cunningham, and painter, Georgia O'Keeffe. Inspired by the style and subject of their work, they created close-up tightly cropped compositions of flowers (and bugs) that emphasized form, texture, and abstraction. 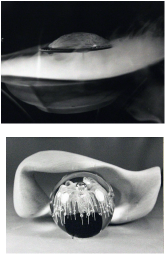 Unit 6: Pop Art Hearts and Cliche-Verre: Students learned a new photographic darkroom technique started in France in the late 1800s called cliche-verre. 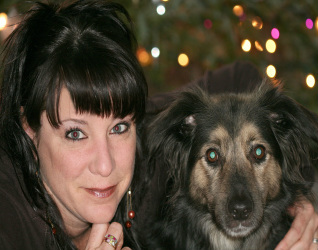 They were also introduced to Pop Artist, Jime Dine, known for his paintings of hearts. 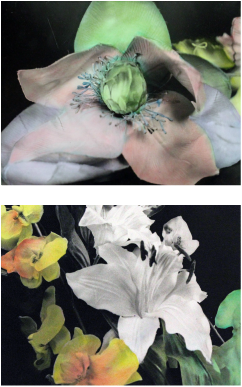 They combined the photography and painting (somewhat) and used the cliche-verre technique to draw the image and transfer as a contact print but created two, one to leave black and white and one to color to look more like a Jim Dine painting. Emphasis was also placed on having multiple values\shades of gray. In 5th grade, emphasis is placed on students exploring a variety of media and materials as well as developing an initial understanding of The Elements of Art - line, texture, shape, form, space, color, value. Unit 1: Sculpture: BRAMS Cake Bakery: Students were introduced to Pop Artist. Wayne Thiebaud. 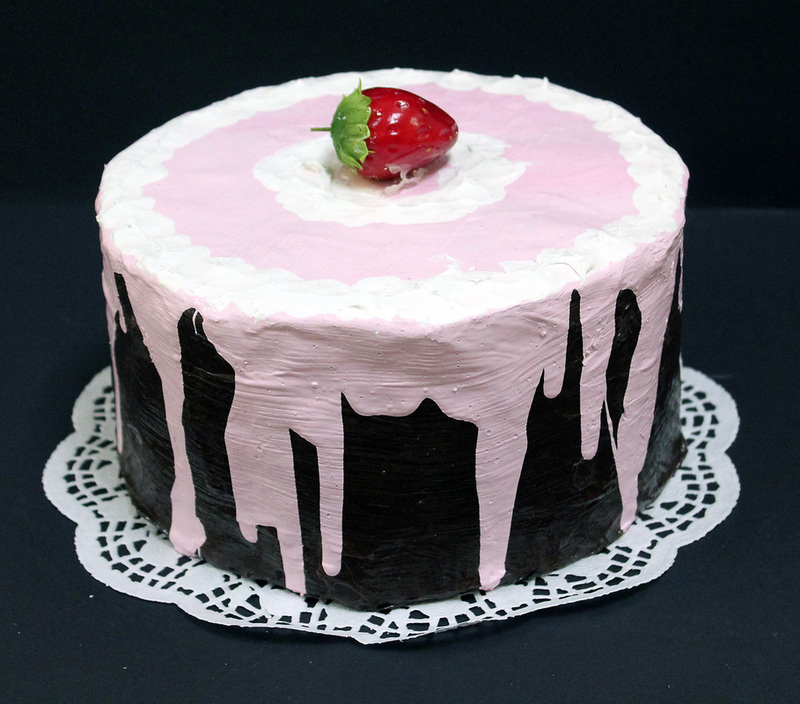 Inspired by his work, they created a 3-D sculpture of a cake out of papier-mache. Emphasis was placed on using colors that look realistic and manipulating brush stoke to achieve different textures such as thick and frosting like or thin, dripping, and glaze or sauce like. 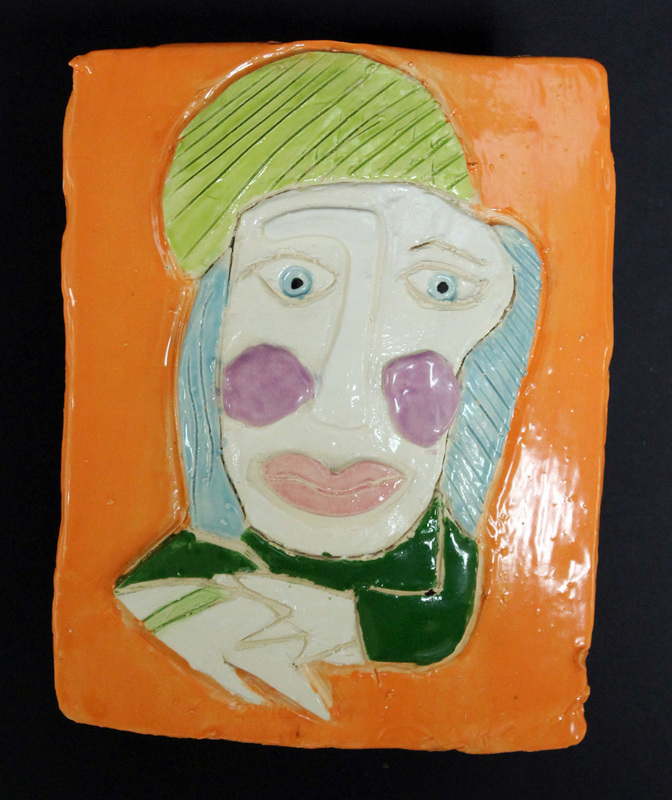 Unit 2: Ceramics: Picasso Pops! Students were introduced to famous artist, Pablo Picasso. Inspired by his two work, they each translated one of his flat 2-D paintings into a "pop up" relief sculpture made out of clay. Emphasis placed on shape and all related clay techniques and vocabulary. 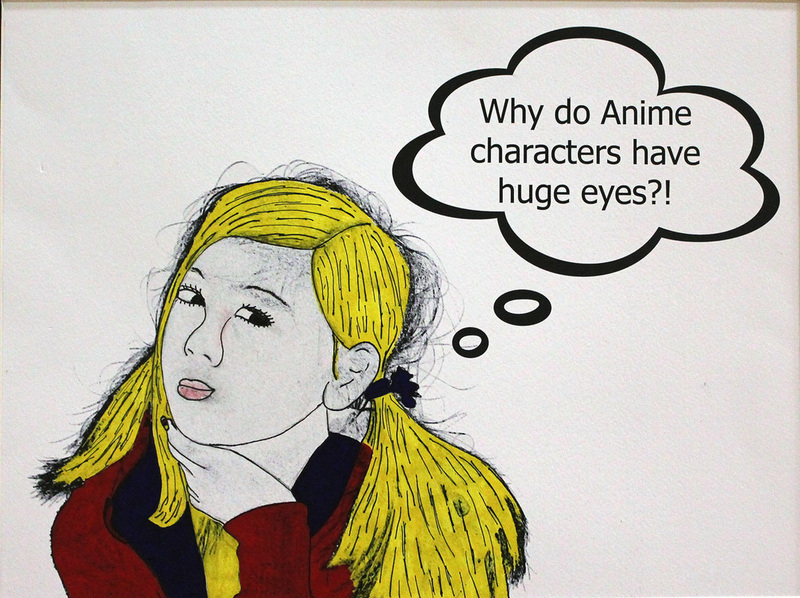 Unit 3: Comic Self-Portraits: Students were introduced to comic artist, Roy Lichtenstein. 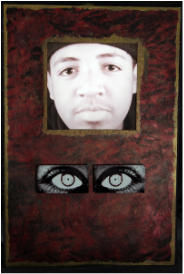 Inspired by his work, they created mixed-media self-portraits which included Photography, Adobe Photoshop, and Drawing. They added thought bubbles to "match" the expressions on their faces. Emphasis was placed on using a specific color scheme and black. Unit 4: PowerPoint Portfolio Presentation: At the end of each year, students create a PowerPoint presentation of all of their work which includes images of each art piece as well as the title\media\purpose of each project. Students are allowed to explore creatively with background design, font choices, and animations while still being encouraged to "keep it clean" and visually appropriate for a professional portfolio.